It feels only right, then, that the tour begins here in Hamburg. With all the charm of a cracked tooth-smile, this ebullient, forgiving port city is a good place for first starts – Brahms and the Beatles cut their teeth here – and for starting over. In the heart of the red-light district, the underground Mojo Club heaves with an immaculately turned-out, motionless crowd – the perfect match for its sleek, minimalist architecture. The stage set-up is accordingly cool, glowing white neon rectangles cutting through the darkness; one can feel a collective intake of breath as Gainsbourg takes the stage. Seated at the piano, she’s framed by the light strips, putting her at a glamorous remove from the audience. As soft as Gainsbourg’s voice is, there’s a toughness at work here, too. 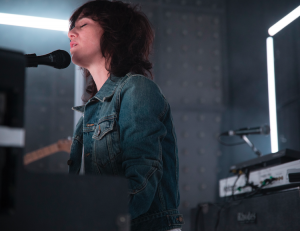 There’d have to be, given the subject matter of these songs; opener Lying With You recalls her experience of lying next to the body of late father Serge Gainsbourg after he died. While some of the album’s more reflective songs don’t quite find the lift they need in this rather airless venue, numbers like gossamer disco strut Sylvia Says really soar. At the gloriously noisy climax of Deadly Valentine, strobes kick into action, Gainsbourg leans artfully against a neon frame and – for a moment – she smiles. But it’s the show’s first encore that feels like a glorious reveal; a delicate cover of Kanye West’s self-disparaging hip-hop anthem, Runaway. It’s funny, in a way – hearing Gainsbourg singing “let’s have a toast for the arseholes” in her beautifully clipped English accent. And it also feels deeply honest, sung by a woman who must surely have seen her share of unchecked egos and wild creativity in her unusual life. MOJO: This was the first gig of the tour. Did you feel nervous about it? 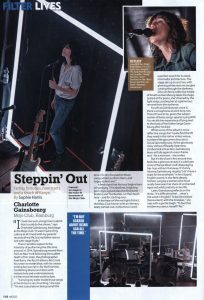 Charlotte Gainsbourg: With a film crew you might be scared of the crew a few days or nervous about a scene, okay, but then you have time and takes and there’s no pressure. You can get in a scene and take your time. This is so immediate. For me, it’s forgetting the lyrics that’s the most nerve-wracking. Well, if you miss some words you have to go on, you can’t erase and start over [smiles]. You’ve talked about the joy of imperfections when you’re recording. Isn’t there a kind of tenderness when you’re sharing that kind of moment with the audience? Yes I understand, [but] it’s difficult to feel, what’s the word in English? To be bienveillant [benevolent] with the mistakes. To feel that tenderness about myself? No [laughs]. Did you see your parents perform often, growing up? No. Not at all. That’s why it took me such a long time to admit that I could do live shows. It’s because it wasn’t part of my culture at all. I lived with my parents’ records all my life, but my father did Le Palace [Enregistrement Public au Théâtre Le Palace] when I was 10 or 11 and he was already 50. So it was sort of a late career thing. And he was so sick with stage fright. Oh yeah. Painfully nervous. And all his life – I mean he only did Casino De Paris and Le Zénith, those two tours, and Les Palace a long time before that. So it was a very big deal to decide to perform. He had already 10 records or more. It was not part of what was expected of an artist. And my mother was the same. She started performing when she was 40. And he was a little sceptical about the whole thing. And that’s the way I was brought up – we did records, they were studio records. There was no point in going live. And we didn’t go and see anybody live, the only shows we went to see were one-man, des comiques… comedians! Who were huge at the time, but that was my education. Not at all live shows. Not rock shows. So it’s only when I started myself quite late when I was 25, I saw Radiohead, Bjork, I saw Fiona Apple. And of course I got emotions from that that were very new, and I could tell that those were very special artists. But so. It was difficult for me to believe that I would be able to do the same. It was hard to make that choice. No, but today, an artist releases an album and it’s so obvious to go live. It’s part of what you’re supposed to do. When I started, it wasn’t. It wasn’t obvious at all. If you didn’t need to do it, records sold. Did you feel reluctant about performing these very personal songs live? I didn’t want to do television – with Rest or with Kate, or with any song that was too emotional or too close to my sister – because television is something that is too close to selling. And I didn’t feel comfortable with that. But then very soon I understood that carrying my sister inside those songs in live shows, and to be able to go on for quite a while – because I’ve got festivals this summer and then it should go on maybe next fall – but to be able to carry the album for quite a while is very touching. It’s lovely, that. I’m not scared about being sad all the time. Or worrying about the effect it’ll have on me. No, no, no. I’m very focussed on those songs while I perform them and I’m very happy to be there. And now it’s a different step. It’s funny how I need steps. Making the album was very intimate. I was with Sebastian but it was very much a dialogue I had with myself. That I shared with Sebastian and I needed his approval sometimes and his feelings on every song. But it was very much a solitary mechanism and work. And I loved that. But that took four years. And then it was taking the decision that it was finished and that we were ready. So then I could carry the visuals into a few videos. Trying to carry the images I had in my head. So it was a different vision of the album. And then the album got released. And I still don’t know what people feel? It’s only now actually that I can see who likes the record, who’s coming. The Kanye cover [Runaway] felt very honest. How did it resonate, for you? Yes, I love doing this song. We had to a television song called Taratata. And you have to do a cover when you go into the show and it has to be a cover that you’ve never done before. So I had a few choices and then this came as such an obvious, just because it would be so different. It’s always difficult when you do a cover that you love to, you want to do it differently but you have the original in your mind that will always be the best. So it’s hard to find your way inside. To feel that it’s worth it. And with this, I don’t know if it’s worth it but I’m having such pleasure, it’s like when I did this Dylan cover, Just Like a Woman, because I was singing it as a woman the whole meaning was different. It was completely contradictory. This is a bit of the same thing. With the subject. I don’t know what to understand really of what he’s, the way he’s addressing other men? I have to address those men but being a woman. So it’s different. But it’s fun to be able to make it my own. It’s fun to do it in a soft way. There’s a lot of humour behind his work, which is great. 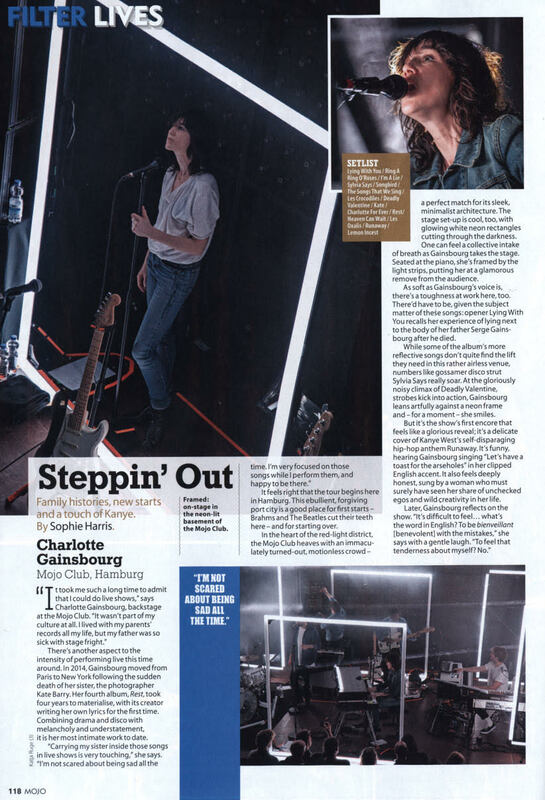 This entry was posted in Features and tagged charlotte gainsbourg, MOJO. Bookmark the permalink.